The Alhambra was a palace, a citadel, a fortress and home of the Nasrid Sultans, high government officials, servants of the court and elite soldiers of the Nasrid Dynasty (1238-1492), the last Islamic sultanate in the lberian Peninsula. Together with the Mezquita (Great Mosque) of Cordoba, the Alhambra is one of the most widely known of all Islamic works of art. NEW TICKET INFORMATION: A great new service from Tiqets.com allows you to Order Alhambra Palace Tickets and have them delivered to your mobile phone saving you a lot of hassle when you arrive in Granada. The Nasrid Sultans chose as the site for their court the Sabika hill, one of the foothills of Sierra Nevada on the plain of Granada which constituted an excellent site from which to keep watch over the capital of their kingdom and the surrounding area. From the beginning of the 13th century, the small older buildings, mainly watchtowers, some of which dated back to before the XI century, gradually grew into a huge walled site which clearly intended to be both palace and court. (See Moorish History of Spain). Within this gradual change, different stages of development can clearly be seen through the various works of art and buildings erected over the years. The Alhambra was not a single static construction built at a specific date, but rather the result of an evolution, successive reforms and extensions. 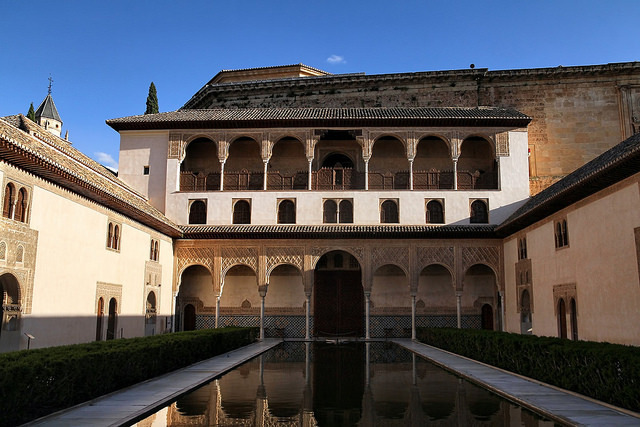 The highlight of your visit to the Alhambra Palace will be the time you spend in the Nasrid Palaces (Palacios Nazaríes). These Royal Palaces consist of a number of brilliantly designed and decorated function rooms and courtyards that were used by the Muslim rulers for different purposes. The Royal Palaces were divided into three distinct parts: the Mexuar, the Serallo and the Harem. Each of these palaces contained a number of rooms which were used for different purposes and they were designed around a central courtyard. Mexuar Palace: This is the first series of rooms you enter. It was here that the Sultan met with his ministers to consult on state affairs and he also received members of the public to listen to their petitions. Next you pass into the beautiful Mudéjar-style Cuarto Dorado (Golden Room). This is where the sultan made his most important decisions as military commander-in-chief. The room was redecorated in its present golden colour during Carlos Vs period on the throne. Opposite the Cuarto Dorado is the entrance to the Serallo. Serallo: This was the official residence of the emir or sultan and its rooms surround the Patio de los Arrayanes (Patio of the Myrtles) with its large central pool. In the Sala de la Barca which lies through the north portico of the Patio the wooden ceiling is an inverted boat shape. This room leads into the impressive Salón de Embajadores where the sultans carried out negotiations with Christian emissaries. Moving on from here you will arrive at the famous Patio de los Leones which lies at the heart of the Harem section. It was built for sultan Muhammed V in 1378 with a central fountain supported by 12 tame-looking lions. Ibn Zamrak’s poem, engraved on the fountain, praises the sultan and this beautiful palace garden, planted with trees and aromatic herbs. It’s surrounded by a gallery with 124 marble columns that overlooks three of the most attractive rooms in the complex. Harem: The Patio de los Leones is surrounded by four buildings where the sultan and his closest family lived. On the south side is the Sala de los Abencerrajes which is astonishing for its domed ceiling with stalactite vaulting producing a star like effect. The water in the marble fountain reflects the image of the brilliant ceiling above. The sultan’s wives lived on the second floor. This room gets its name from the legend that the penultimate Moorish ruler of Granada, Abu al-Hasan (Muley Hacem) had the nobles of the Abencerraje family murdered here because the head of the family dared to flirt with Zoraya, the harem favourite. The Abencerrajes also favoured the rival Boabdil in the palace power struggle. On the north side of the patio is the beautiful Sala de dos Hermanas (Hall of the Two Sisters) which is named after the two slabs of white marble either side of its fountain. At the far end is the Sala de los Ajimeces which was the dressing room of the favoured lady. From here she could lie on cushions and admire the mountains through the low windows. The Sala de los Reyes (Hall of the Kings) on the east end of the patio contains various medieval paintings. It is named after the painting on leather in the centre of the ceiling which shows 10 Nasrid emirs. Generalife Gardens: Literally this means “the garden of the architect”. The area consists of beautiful gardens, fountains and patios where the Moorish leaders had their summer palace built. If you come in at the entrance behind the ticket office this is the first part of the Alhambra that you’ll see. Alcazaba (Fortress): If you’ve already collected your ticket the best place to enter the Alhambra Palace complex is through the Puerta de la Justicia which leads to the Alcazaba. This fortress acted as the military headquarters for the Nasrid dynasty. It was built on the highest point of the hill to defend the royal family and house their army. The original construction had 24 towers but only a few remain. Past the central patio (Plaza de las Armas), you’ll see an Arab bathhouse, living quarters, stables and dungeons. 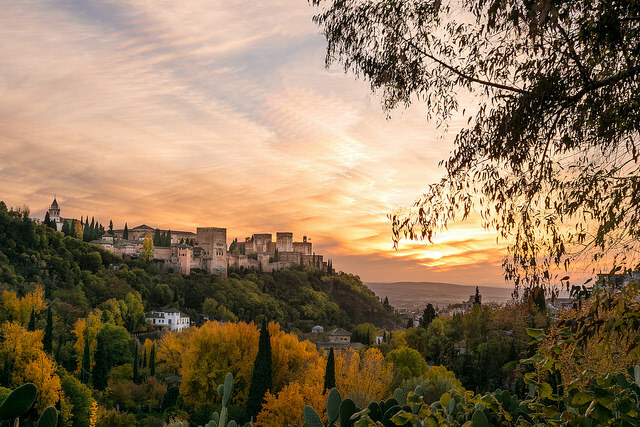 Climb up the steps to the defensive walls of the Torre de la Vela watchtower for fantastic views over the neighbouring Albayzín and Sacromonte districts. Carlos V’s Palace: The massive bulk of the Renaissance-style Carlos V’s Palace stands in stark contrast to the delicate Moorish Royal Palaces next door. It has two museums worth visiting either before or after the rest of the Alhambra complex. The ground floor Alhambra Museum displays a wonderful collection of furniture, paintings, ceramics and coins from the Nasrid period. The Fine Art Museum upstairs contains some excellent religious paintings and sculpture from the 16th and 17th centuries. The palace itself was built for Emperor Carlos V in 1527 so is not from the Moorish era. The central courtyard now acts as an atmospheric venue for orchestras and theatre companies during Granada’s International Festival of Music and Dance. Medina (Town): The Medina was created to house craftsmen and serve the needs of the court. It occupies the largest part of the walled area within the upper Alhambra and still conserves the ruins of several houses, baths and small workshops on its typical alleys and squares. Santa María Church: This early 17th-century church was built on top of a mosque in the Alhambra complex and contains important works of art. San Francisco Parador: This was once a mosque, then a monastery and is now a wonderful four-star hotel. Morning Ticket: Monday to Sunday: 8.30 am to 2 p.m. This gives complete access to the Alcazaba, the Nasrid Palaces and the Generalife gardens. Afternoon Ticket: Monday to Sunday from 2pm to 6pm (October 15th to March 14th) and 2pm to 8pm (March 15th to October 14th). This gives complete access to the Alcazaba, the Nasrid Palaces and the Generalife gardens. Evening Visit: There are also evening tickets available which allow you to visit EITHER the Nasrid Palaces OR the Generalife gardens. These are separate visits taking place at the same time so you have to decide which area you wish to visit at this time. Times are provided on the Ticketmaster website. Please check ticket information on the ticket supplier’s website as they may be subject to change. Most of your time at the Alhambra Palace complex will be spent in the Nasrid Palaces. A complete tour of the Alhambra Palace complex takes about three hours. You should organise your visit according to the assigned time of admission to the Nasrid Palaces which you will be given when you buy your tickets. Entrance to the Nasrid Palaces is strictly limited to the half hour indicated on your ticket due to the restrictions on maximum capacity in this area (350 people each half hour). You will be refused admission outside this time band. For overseas visitors it’s a good idea to pre-book tickets online up to 90 days before your planned visit through the Spanish Ticketmaster Website. Before ordering your tickets make sure that you do not use a credit card which has an expiry date before the date of your planned visit otherwise the Servicaixa terminals will not issue your tickets on the day of your visit. Once your booking is confirmed you will receive an email showing clearly what time (within 30 minutes) you are allowed to enter the Nasrid Palaces. When collecting your tickets at the Alhambra Palace be sure to have the credit card that you booked with in order to print your tickets from one of the ServiCaixa terminals located in the ticket booth next to the bookshop. Just put in your credit card and follow the instructions to have your tickets printed. It’s a good idea to arrive at least one hour before your alloted time for the Nasrid Palaces. This allows you to leisurely collect your tickets then visit the Generalife Gardens before the Palaces. Don’t forget that you must enter the Nasrid Palaces during your 30 minute time slot or you will be denied entry. 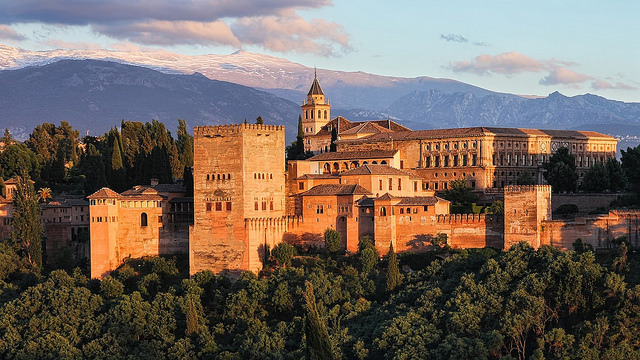 If you do arrive in Granada (or Spain) without tickets you can still try to buy Alhambra tickets from any Servicaixa machines located in branches of La Caixa bank nationwide. Some tickets do go on sale every morning when the ticket office opens at 8.30am but you’ll need to get there early as long queues quickly develop especially during the high season. The Alhambra Palace ticket office is at the entrance pavilion near the parking. Tickets are sold out for many dates so for peace of mind and to avoid long queues in the hot sun you should book tickets in advance. Skip-the-Line Ticket and Tour: A great way to avoid the hassle of having to worry about getting tickets when you arrive in Granada is to book tickets which are delivered to your mobile phone. This very efficient service allows you to book in advance or at short notice and includes a small group tour of the Alhambra. Private Tours: For something a little more exclusive you can book a private Alhambra Tour which gets you your own guide for the visit to the Palaces. These private guides are very friendly and have such a passion for the Alhambra. If you can afford the extra expense of the private tour then you’ll find that it’s money well spent. Bono Turistico: The Alhambra often sells out and many people who leave buying tickets until the last minute find themselves unable to gain access. A possible solution is to buy the Granada City Pass (Bono Turistico) which provides access to all the city’s main tourist attractions including the Alhambra. These passes are usually still available even when Alhambra tickets have sold out. Excursions from the Costa del Sol: Full day excursions are available for people who are staying on the Costa del Sol. There are departures to Granada from Marbella, Estepona or Torremolinos which include a visit to the Alhambra.